Most people think of research as improving lives. Spokane leaders know it is also changing our economy. Consider WSU Spokane: Research dollars on campus have nearly doubled in the last few years. Our health sciences research portfolio has grown significantly, now encompassing genetics, cancer, kidney disease, diabetes, addictions, neuropharmacology, exercise physiology, mental health, sleep, neuroscience, behavioral health and molecular biosciences. Employment has increased dramatically, accompanied by a payroll that contributes to the economy through rents and mortgages, household purchases, and entertainment outings. The last two years, in particular, have seen significant economic impact to Spokane with the move of the College of Pharmacy to Spokane from Pullman and the recruitment of several new renowned researchers. Some of the new recruitments were made possible by grants from the Health Sciences and Services Authority (HSSA) of Spokane County. Since 2012, HSSA has committed $3.2 million for high-end laboratory equipment and for startup packages for national-level researchers. The first researcher to arrive through HSSA was Mike Gibson, Ph.D., leader of Experimental & Systems Pharmacology in the College of Pharmacy, who studies rare inherited disorders related to metabolism and how they are affected by diet, drugs and cellular treatments. Philip Lazarus, Ph.D., chair of the College’s Department of Pharmaceutical Sciences, followed. He examines the role of genetics in the activity of the enzymes that metabolize drugs and carcinogens. Between them, Gibson and Lazarus have brought almost $3 million in external funding to the campus. They have also spearheaded recruitment efforts that have attracted six new tenure-track faculty who have in turn brought a number of other research faculty and staff members with them. Since the two arrived, Pharmacy has received more than $17.5 million in new funding, of which at least $14 million is attributable in part to HSSA as a result of the new recruits who brought grants with them as well as grants that use HSSA-funded equipment. “That $14 million is a huge return on HSSA’s investment,” said Dean Gary Pollack, Ph.D. Within the next two years, HSSA’s recruitment of Gibson and Lazarus and two other highly regarded researchers will result in even more research-intensive faculty, research staff (technicians, postdoctoral fellows, and research-track faculty) and Ph.D.-seeking graduate students moving to Spokane. Two years ago the College employed 26 people in Spokane. Now it has 156 staff and faculty. This includes more than 40 faculty and graduate students who have relocated to Spokane as a result of the recruitment efforts by Pharmacy alone. Most of the rest are a result of Pharmacy’s move to Spokane from Pullman. The total payroll for the College is $11.5 million. As the College grows, the faculty, staff and students buy or rent homes, shop at local stores, attend cultural events, and contribute to the community by participating in their children’s schools, their places of worship and their civic groups. In many cases, they also work to commercialize their research. Mark VanDam, Ph.D., assistant professor of the Department of Speech and Hearing Sciences, is another example of a researcher who moved to Spokane. 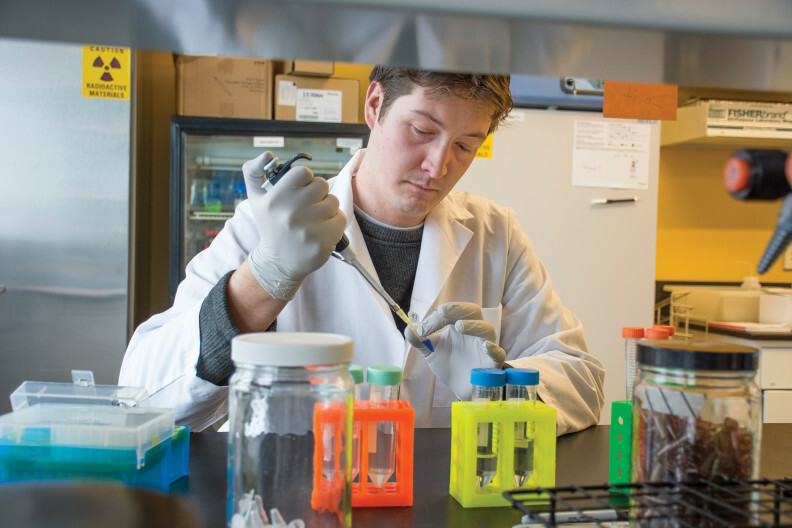 He is in the College of Medical Sciences and is hoping his work will lead to health benefits for those suffering from Parkinson’s disease, of which there are an estimated 22,000 in Washington and 1,600 in Spokane County. VanDam’s speech and voice biofeedback device will help improve Parkinson’s patients’ lives by giving them the ability to engage more fully. The wearable, real-time vocal biofeedback device alerts the wearer to adjust speech and voice production characteristics such as speaking volume. Someday it might be commercialized. Hans Van Dongen, Ph.D., director of the Sleep and Performance Research Center, is a step or two further along than VanDam. He has received gap funding from the WSU Office of Commercialization that will help get his patented drowsiness driver detection technology ready for commercialization. The Office of Commercialization helps WSU researchers navigate the path from innovation to the marketplace. “We ensure their valuable discoveries are protected where possible, and prepared for startup generation or potential licensing by third parties,” said Anson Fatland, associate vice president of Economic Development for WSU. Once these prerequisites are in place, productive researchers form teams that compete successfully for funding from federal sources or organizations like the Life Sciences Discovery Fund (LSDF) or HSSA. “That’s exactly what is happening at WSU Spokane,” said Chancellor Lisa Brown. John Roll, Ph.D., is one of two researchers from WSU Spokane to receive a LSDF grant. LSDF invests monies from the state’s Master Tobacco Settlement Agreement and from private and corporate donors in research and development projects across Washington that demonstrate the strongest potential for delivering health and economic returns to the state. Roll’s grant for more than $4 million covers opiate addiction and chronic pain in rural communities, among other subjects, and gives more than 200 physicians and nurses better training to combat addiction. Some estimate that substance abuse treatment yields $3.77 in economic benefit for every dollar spent on treatment costs. Roll is the senior vice chancellor for academic affairs and research, and holds faculty positions in the College of Nursing and other programs. He is the most well-funded researcher on campus. The research of Weihang Chai, Ph.D., focuses on understanding the molecular and cellular processes for initiation of cancer and premature aging. “We study how various proteins interact with genome DNA and protect genome stability. It is our hope that our findings will be applied in therapeutic research for facilitating the cure of cancer and age-related disease,” said Chai. Like their colleagues in the College of Pharmacy, Roll’s and Chai’s work in the colleges of Nursing and Medical Sciences, respectively, have resulted in the recruitment of several other researchers to Spokane as well. Chai is part of a growing cadre of faculty in the new College of Medical Sciences and in what WSU plans to be part of the new medical school. The likelihood of a WSU medical school in Spokane increases research and economic impact opportunities. Medical schools are economic engines that attract federal research dollars and create jobs and the potential for new spin-off companies. WSU Spokane has five new core research facilities in various stages of availability for external users. These were funded in full or part by the Health Sciences and Services Authority (HSSA) of Spokane County. HSSA required, as part of its investment in the core facilities, that the equipment be available to both public and private researchers from the area at a small rental cost. In addition to saving resources, the requirement encourages collaboration among researchers, a key condition of HSSA. For more information about all core research facilities, visit spokane.wsu.edu/research/instrument-access. Farthest along is the genomics lab where DNA can be sequenced and analyzed with the help of expertise from faculty. The state-of-the-art instruments can decode DNA and sequence an entire human genome in one day. In 2001 it took the Human Genome Project 10 years to sequence one person’s genome. A person’s DNA can provide information about individual disease predisposition and response to medications, and can help scientists decipher how genes coordinate with tissues and organs, how the body develops, and how environmental factors affect genetic profiles. Differences in individuals’ DNA are responsible for the development of many human conditions and determine how the body responds to toxins and drugs. In the near future, by tailoring recommendations to each person’s DNA, health care professionals can focus on the specific strategies most likely to maintain or restore health for that particular individual—from diet to high-tech medical surveillance. For more information, contact Spok.GenomicsCore@wsu.edu or visit labs.wsu.edu/genomicscore.